In this video we breakdown how Cory approaches some of his melodic improvisation ideas. The first video is Part 2 of the Youtube Video. In the second video we go much further and explore some of the other improv ideas!!! Travis has a really unique way of playing and he uses so many nice bebop movements with his improvisation. In this next page we take a deeper look at how to form some of these bebop lines and add them to your playing and also similar lines from Travis. Join us as we finally break down a live Kevin Bond song, "Promise" as he uses some unique and signature voicings and movements. This tutorial is packed with chords and movements, while still appealing to the musician who has not been playing a long time. 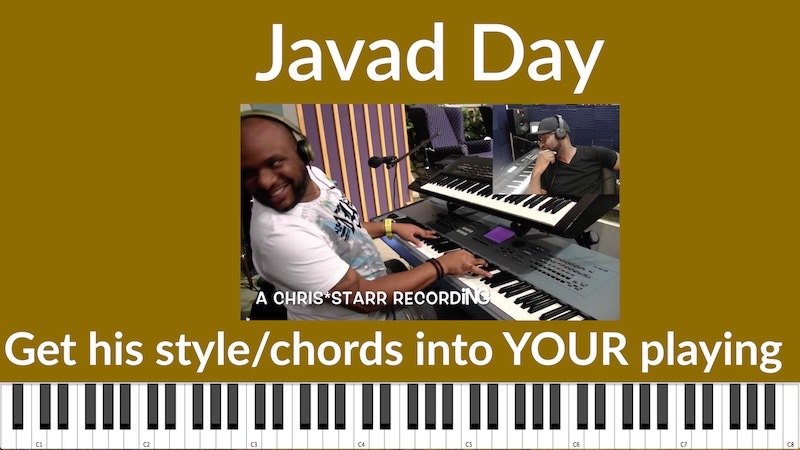 Learn how Javad Day constructs his chords and add some cool passing movements to your progressions. Learn some Nice Neo-Soul Gospel chords in this version of Holy Ghost by Kim Burrell. New Training on our New RoadMap! This training is significant and should be watched by all members. After the completion of this training, head over to the roadmap and take inventory of your current skills. What you know and don't know for each level. This video goes over Cory's on the spot Improvisation of "Lift Every Voice" on the Piano. This video goes over how to play "I know that my Redeemer Liveth" on the Piano. There is a full tutorial on this post, a midi file, and an audio file!! This video goes over how to play "Well Done" on the Piano. Take particular interest in the Vamp chords towards the end. There is a full tutorial on this post, a midi file, a PDF chord sheet, and more!! Do you need licks??? Look no further, this page is packed with licks from Dvon Cruz, the Licks King and Master Instructor! Dvon has a total of 5 different types of licks you can use for every situation! Jospeh Pryor blazes this song on Instagram like you've never seen! Watch the video to see three suggestions on playing this song. Eddie Brown plays "I have decided" by Maurette Brown in this post. An one hour teaching lesson with great teaching suggestions to improve on how you currently look at hymns!!! This video is a tutorial for the song "In the Midst of it All", by Kevin Bond on the piano. This web post is an accompaniment to the video on 9 Gospel Lines you need to learn. If you've been wanting to learn how to create your own solos and gospel licks, then study the gospel patterns in this post. This page shows us three songs from Aaron Lindsey. Go ahead and click the link to see Full tutorials on how to play both songs. Starting at the beginner level and also hitting some advanced concepts as well!